My Early Life in England. From Karachi, we were to sail on the S.S. Caledonia that belonged to the Anchor Line. This vessel carried only one class of passengers. The vessel was to sail in the afternoon of Friday 23rd January 1959. After attending the Friday service at the Ahmadiyya mosque Karachi, along with my wife and my son Munir Ahmad I went to the Port. At the time of departure of the ship, Dr. Saeed Ahmad Khan and Dr. Basharat Ahmad were also present who had come to bid us farewell. They were then students of Dow Medical College, Karachi. Mr Khaleel ur Rahman, Secretary Ziafat, led a solemn silent prayer and we boarded the ship. Cabin No. B10, which was spacious and very comfortable, had been allotted to us. Apart from two beds, there was a cot for the child. Hot and cold running water was available in the Cabin, and through a porthole, one could see the ocean. After leaving our baggage in the cabin we went up to the Deck. Those who had come to see us off remained on the shore until the ship had gone too far out to the sea. Anchors were weighed at 6.30 p.m. and very slowly we started moving into the open sea. The setting was charged with affection and I was overcome with emotion. It was a touching scene to see not only those who were traveling but also those who had come to see them off shedding tears. Some sobbed openly and others were inconsolable. After such lengthy supplications when I looked around, I could see nothing but water. The shore was no longer visible. As the ambient temperature had dropped considerably, we went back to our cabin. My wife, Salima was so weighed down with emotion that she seemed below par. This was our first journey taking us across the Seven Seas. The parents of both of us were alive and they had, with tears in their eyes, bid us farewell. By remembering them both, we attempted to warm our hearts. In those days, many who traversed the Seven Seas never returned. Many adopted European customs and settled in the West. Therefore, naturally, the relatives of those who embarked on journeys to Europe became extremely apprehensive. 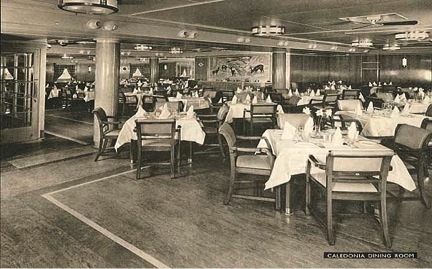 After resting a while in the cabins all the passengers assembled in the Dining Room for the evening meal. I discovered that at various tables ladies and gentlemen, all mixed together, were seated. Of all the women on the ship, my wife was the only one who observed Purdah. Most women were Europeans and the remaining Asian women regarded Purdah as a ludicrous ancient custom. I sat at a table and asked a steward to take my wife’s dinner into the cabin as she observed Purdah and could not join other men. The steward said that he was permitted to serve only in the Dining Room. He said he would talk to the Captain. In a short while, the steward told me that the Captain wanted to see you. Captain: "You’ve declined to bring your wife into the Dining Room as she observed Purdah and cannot intermix with other males. As you are going to Europe, how will you cope there?" I said, “Sir, I am going to Europe as a missionary of Islam, to make clear to the local population that our ladies hold highly respectable and elevated position according to the teachings of Islam. Purdah is designed to protect the honor and chastity of women. How can I turn away from an objective, which is contrary to my mission in Europe?" Captain: "In my view, imprisoning ladies in Purdah is tantamount to being narrow minded. If women were given free choice not one of them would volunteer to remain in this jail.” I said, "Sir, my wife is an educated woman. She is intelligent and she has quite happily and of her own will, decided to remain in Purdah. There is no pressure on her from my side. I can prove it by asking you to talk to her yourself. Having full regard to the fact that she observes Purdah you can meet her." Captain: "If you insist. Would it not be proper that without any third person you two can sit on a separate table in the Dining Room?" I said, “This will be a most appropriate arrangement and I will be grateful to you." The Captain issued orders and we had the advantage of sitting at a table by ourselves. At 8 o clock on the morning of 27th January the shore became visible. Almost all the passengers assembled on the deck. The sight of land appeared most attractive as we saw the land for the first time in four days. Around eleven o clock the ship dropped anchor outside the Aden harbor. 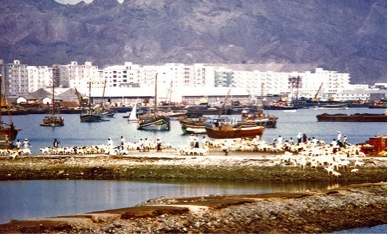 In Aden, the ships always anchored away from the shore and motorboats were used to take passengers ashore. The Captain announced that to look around passengers could go ashore but must return before 7.00 p.m. as the ship would then sail. The Jamaat has an outstanding historic bond with Aden. Once when Maharajah Daleep Singh was returning to India from his exile in England, it was from Aden that he was ordered to return to England. 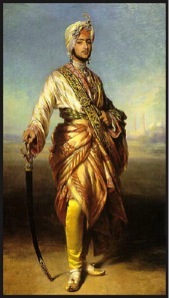 When the British defeated the Sikh Government, they took the young prince Daleep Singh to England so that the commotion amongst Sikhs may subside. Maharajah Daleep Singh arrived in London when he was very young. He was housed in Guildford and then he moved to London. A beautiful Hotel named Cannizaro is situated in Wimbledon. Before the building became a Hotel, it belonged to Maharajah Daleep Singh and he stayed in it for some time. Daleep Singh had a very cordial relationship with Queen Victoria and he was often invited into the Royal Palace. Once, while they were drinking tea on a balcony in the Buckingham Palace, Daleep Singh expressed a desire to have a glimpse of the Kohinoor diamond. 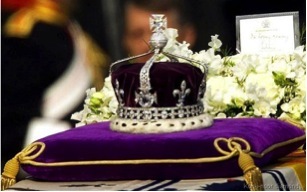 The Queen went into her room and brought the Kohinoor. The Maharajah put it on the palm of his hand. To look at it in a better light he walked to the end of the balcony. The Queen dreaded that the Maharajah might throw the diamond away. Daleep Singh, who was a very intelligent person, guessed the Queen’s suspicion and said to her: “Madam! The rightful owner of the diamond would like to present it to your Majesty”. The Queen repossessed the diamond and appreciated Daleep Singh’s sense of humor. Kohi Noor in front of Royal British Crown. Daleep Singh had an intense desire to visit the Punjab, stay there for a while and meet his near and dear ones. On a number of occasions, he had sought permission from the British Government and finally permission was granted. However, as soon as the Maharajah boarded a ship, the Indian newspapers published the news and with great anticipation, many started waiting impatiently for the Maharajah to land on the Indian soil. There was great eagerness, particularly amongst the Sikhs. To welcome him they made programs to hold elaborate functions. In anticipation, there was merrymaking all around. The Maharajah was seeing visions of an astounding reception and a bright future. 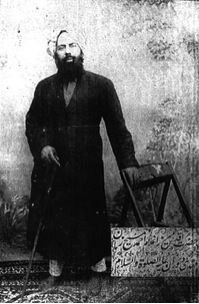 Hazrat Mirza Ghulam Ahmad, Alaihi Salam. should be prevented from returning to India. It was feared that if he returned to the Punjab the movement to hold his Coronation would be revived and strengthened and then the British Government might have to face problems. By then the ship had actually reached Aden. Accepting this advice, the British Government ordered that the Maharaja should be taken off the ship and returned to England on another ship. That was exactly what happened and that was exactly in accordance with the information from the Almighty. Before leaving Rabwah, I had advised Mr. Abdullah Shabooti, the father of my dear friend Mahmood Shabooti that I would be passing through Aden. Mr Abdullah who lived in Aden was a dedicated and devoted Ahmadi. After having accepted Ahmadiyyat, he had to face innumerable problems but he never wavered. As soon as our ship had anchored, Mr Abdullah, along with a Somalian servant, came on to the deck. He welcomed me with warmth and deep affection. To look around Aden and meet other members of the Jamaat, he asked me to spend the whole day with him. He invited me to attend a Reception being arranged by members of the Aden Ahmadiyya Jamaat. By a motorboat, along with him, accompanied by my wife and Munir Ahmad we landed at the harbor. 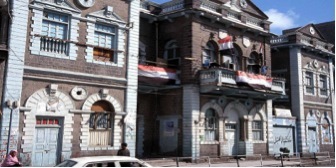 From there, in his motorcar, we went to call at Dr. Muhammad Ahmad’s surgery in Aden. The Doctor was of Indian descent and was indeed a devoted and a committed Ahmadi. Two of his sons were my class fellows in Qadian. We stayed with him until lunchtime and met many friends and exchanged views. After Zohr, along with some members of the Jamaat, we set out sightseeing. Aden had assumed a modern pattern. 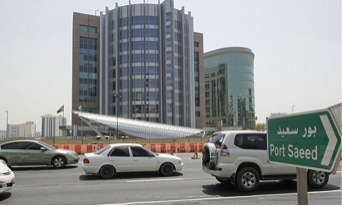 Tall and stylish buildings had been built on an attractive dual carriageway. It presented a pleasing picture. In the evening, we returned to the ship. Mr Abdullah’s love and devotion, his dedicated approach to the Jamaat and his firm commitment to Khilafat, left an indelible mark on me. Mr. Abdullah was probably the first Ahmadi in Aden. The ship proceeded towards its next destination. Once again we were encircled by water. Very early on 31st January, when it was still dark, we entered the Suez Canal. 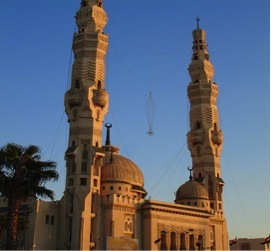 Right alongside is situated the township of Suez. On either side of the canal, there were small villages and the local population was seemed engaged in agriculture. Most passengers came out on deck, as the landscape on either side of the canal was eye-catching. At 11 o’clock, the ship entered the Great Bitter Lake in which, at that time, fifteen to twenty ships were already anchored. 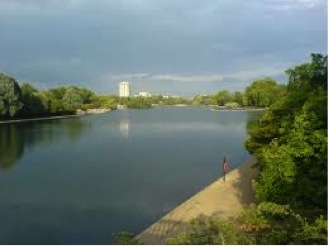 There are three or four of such spacious lakes along the canal. To ensure smooth flow of traffic some vessels from either side are asked to wait there. Thus, there is no problem in navigation and the traffic flows unhindered. Our ship remained on anchor until 5 p.m. In the canal, ships may not exceed the speed of five miles per hour. 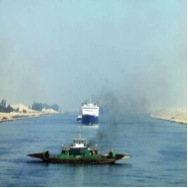 While in the canal the ships remain under the control of Egyptian pilots. At that time, to pass through the canal, every large vessel had to pay £3,000 as canal fees. The Suez Canal is 118 feet wide and 30 feet deep. It stretches over a distance of 101 miles. At one end of the canal is Suez and at the other Port Saeed. It joins the Red Sea with the Mediterranean. We reached Port Saeed at 1 a.m. and anchored there for the night. It was announced in the morning that those who wished to look around the town could leave the ship after breakfast. They were warned to exercise great care against pickpockets and cheats. This announcement came as a shock to me as we were to land in a Muslim country where the reputation of the locals was so appalling. We hired a taxi that took us around the town in exchange of 10 shillings. A wealthy person named Abd ur Rahman had built a most beautiful Mosque in Port Saeed. To decorate the Mosque, beautiful Turkish carpets and Venetian chandeliers had been provided. In the dealings in the streets of Port Saeed, there was no trace of decency or honesty. It is indeed regrettable and a shame that tourists were often asked ten times the acceptable price. An old lady from Bombay who was sailing on SS Caledonia died of Heart attack between Port Saeed and Gibraltar. We were very sad to learn of the sad demise of the lady. Her son and daughter in law were badly grief stricken. 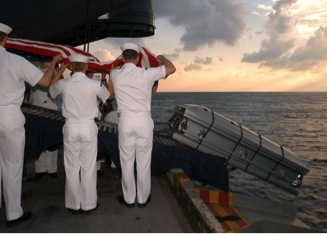 Late in the afternoon it was announced that the lady would be buried at sea according to the maritime laws. All the passengers gathered on the deck. The body of the lady was lying on a stretcher on the edge of the deck. In complete silence a vicar recited some prayers and sprinkled some holy water on the body. The Captain of the ship then signaled to bury the body and Stewarts promptly dropped the body in the sea. At 4.30 in the afternoon on February 3rd, the ship started sailing towards Gibraltar. During that part of the voyage, instructions were received from the British Government that a few British soldiers had to be picked up from Cyprus. 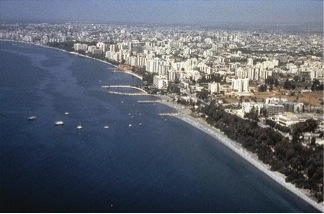 Therefore, the ship had to make a detour and the next day we arrived at Limassol, a Cypriot port. Offering all kinds of alcoholic drinks at ridiculously low prices a number of small boats came alongside. The European passengers showed great interest and a large number of bottles were purchased. On enquiry, I was told that there were a number of breweries that were able to sell their products at highly discounted prices. So much so that some exchanged a bottle of wine for a packet of cigarettes. We were not allowed to go ashore at Limassol but we were able to view the beautiful township from the deck. Hills covered with greenery presented an attractive panorama. View of Limassol Harbor from the ship. We anchored in Gibraltar on 7th February. I had an emotional attachment with Gibraltar. When I was a student in the 10th Grade, I was very fond of reading novels unfolding Spanish Islamic history. As a result, I had fallen in love with Spain. The Muslim conquest of Spain sprang from Gibraltar. I had repeatedly explored Gibraltar in my imagin0ation and now I could see it with my own eyes. I had strange emotions. Gibraltar’s original name was Jabl ut Tariq. It is only a rock from where one can survey Spain. It was from that point that General Tariq Ibe Ziad first scrutinized Spain. He burnt all his ships and announced that there was no question of a return. He declared that they would either conquer Spain or lay down their lives in the attempt. When the ship had dropped its anchor at Gibraltar, I continued to pray for General Tariq. I also prayed that once again the followers of the Messiah might be enabled to re-establish Islam in that country. As the ship had to remain in Gibraltar for a whole day passengers were allowed to go ashore and we too disembarked. We offered prayers at the exact spot where General Tariq had made his strategy to conquer Spain. In order to identify the exact spot where General Tariq stood a plaque, with commemorative inscription in English, has been fixed. There is any number of monkeys in Gibraltar and the British Government protects them. 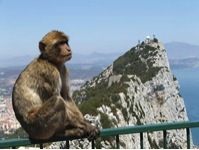 It is said that according to a legend, the day the monkeys abandon the Rock the British Government will have to leave Gibraltar. It is indeed very strange that the British, who have made such great strides in Science, should be so superstitious. 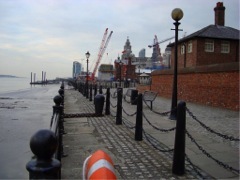 Early in the morning on 18th February 1959, our ship dropped anchor at Liverpool and thus our voyage ended. However, because of very thick fog it was impossible to disembark immediately. Once the fog had lifted, we went ashore and boarded the train for London. We reached Euston station by 6 o’clock. It was strange that at the point of disembarkation from the ship no one checked our Passports. An official sat on a chair and from a distance the passengers showed him their Passports and proceeded. No entry was made on the Passport nor was it stamped. Those days were strange; there was no need for an Entry Permit and nor was there a problem about Visas. Having retrieved our baggage we heard an announcement that the London Boat train was about to depart and that the passengers should board. 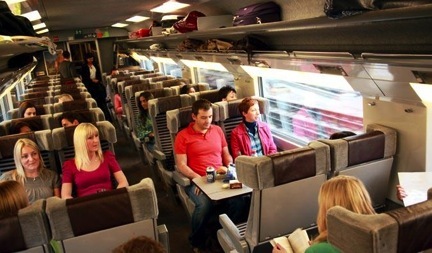 That was the first time that we had travelled on a British train and we were deeply impressed with the cleanliness of it. There was no comparison at all with trains in the Indian Sub Continent. Here they were neat and clean and they ran on time. May our country learn a lesson from the British? From Liverpool, it took us six hours to reach London. On either side of the train, we saw nothing but snow. It appeared that nature had covered the land with a snow-white sheet. However, the train was well heated. All of us had taken off our coats and some even removed their jackets. One felt reasonably comfortable in shirtsleeves or in a jumper. Because it is a Port town, Liverpool is always very busy. Around 1890, in Liverpool an Englishman accepted Islam and chose Abdullah as his first name. 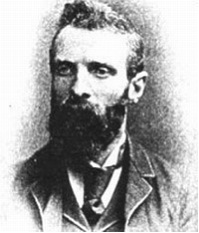 His surname was perhaps Quillim and therefore he was known as Abdullah Quillim. He had started an Islamic periodical through which 15 or 20 gentlemen and ladies had embraced Islam. The Promised Messiah had made a mention of him in his writings. This mission died with Abdullah and now no one knew him. The train reached Euston station at 7.30 p.m.
At Euston Station we were received by Imam of the London Mosque Maulood Ahmad Khan, Abdul Aziz Deen, Chaudhry Muhammad Ashraf, Maulvi Abdur Rahman and Professor Sultan Mahmood Shahid. We proceeded towards the Mission House in Maulvi Abdur Rahman Sahib's car. 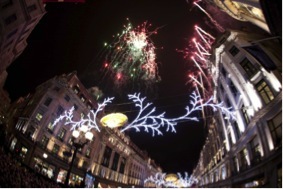 The whole of London was brightly lit with Christmas decorations. The streets and the shops were all lit up with decorative Christmas lights. Up until then I had never seen such a big city. On the way Maulvi Abdur Rahman gave us a running commentary on the various historical buildings that we passed en route. Finally, we arrived at 63, Melrose Road (the Mission House) where the Imam had arranged dinner for us. For the first time in three weeks, we ate spinach with meat, which we greatly relished. During the sea voyage, for fear that it may not be Halal, we had refrained from eating any meat. After dinner, the Imam took us to 61 Melrose Road and showed us into a two-bed room flat on the fourth floor. That was to be our future residence for the next four years. The house at 61 Melrose Road was large and spacious and apart from a basement, there was the ground floor and two other upper floors. Ahmadi tenants occupied two stories of the house. It was very cold that first night. It was rare for houses to have central heating in those days. Normally coal fires or kerosene heaters were used for heating the houses but in our flat, we did not have either of these two facilities. We wrapped ourselves in the quilts that we had brought from Pakistan but despite that, we hardly slept due to the severe cold. 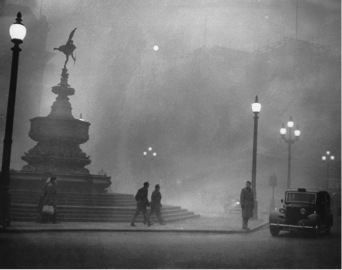 In 50's and 60's London was well known for its very severe winters. In the afternoon Maulvi Abdur Rahman came to the Mission House. He heard our account of the bitter cold over the previous night. Since he was also a member of the Finance Committee he confirmed that there was no room in the budget for any extras, but he graciously promised that he would take it upon himself to arrange a kerosene oil heater. In a short while, he returned with an Aladdin kerosene oil heater and taught me how to light it. Soon the room became cozy and warm and we breathed a sigh of relief. May Allah grant him an exalted station in Heaven. I cannot ever forget this favour that he did me. After a few days the Imam gave me a list of the members of the UK Jamaat. He said that there were more than two hundred names on the list, (of which the majority were students), some of who may have in fact returned to their respective countries. He asked me to contact all members and note down their correct addresses so that we could establish contact with them, and this may also help with the collection of their financial contributions. B.A. Rafiq, Maulood Ahmad Khan, Maulvi AbdurRehman. After several days’ hard work I was able to identify a hundred and forty nine members. That was the total membership of the UK Jamaat in 1959. The vast majority of the members were young and only a very few lived with their families. Apart from Maulvi Abdur Rahman Sahib, Chaudhry Muhammad Ashraf Sahib and Maulvi Abdul Kareem Sahib, no other member in the entire Jamaat possessed a car. All of these three cars were in regular use by the Jamaat. Whenever the Jamaat called upon these three individuals, they would come to the Mission House with their cars. They even paid for the petrol out of their own pocket. I believe Maulvi Abdur Rahman was sent to England as a Commerce Missionary. Later on, having obtained leave from Waqf, he settled in England and was a devoted servant of the Jamaat. He was an active businessman and had set up different businesses over the years. In 1958, he held a contract to run a canteen attached to the Students’ Hostel owned by the Pakistani Embassy. Through him, many members of the jamaat were able to approach and seek assistance from the Pakistan Embassy. I cannot recall a single occasion where Maulvi Sahib declined to assist. He would rush to the Mission House whenever he was called for any errand. Around this time Chaudhry Muhammad Ashraf Sahib was also living in London. He was a sincere, devoted servant of the Faith and in addition he was very hospitable by nature. On many occasions, he would be adamant and invite friends over to his house and entertain them with good food. His wife, Mrs. Ashraf, later on became President of Lajna Imaullah UK. Like her husband she was incredibly hospitable. She entertained those who visited her home but she also brought all kinds of delicacies to the meetings at the Mission House. Many Ahmadis used Ashraf Sahib’s car for their own personal purposes and it was often jokingly referred to as the Mission House's ‘free taxi’ service. He always refused to accept any contribution towards the cost of petrol. I travelled with him many times to places hundreds of miles from London; he would drive me happily and with a great measure of pride and yet in spite of my repeated requests would not even let me pay for the cost of the petrol. May Allah be pleased with him and grant him an elevated station in Heaven. Hazrat Mir Abdussalam Sahib was a Companion of the Promised Messiah. Before his arrival in Britain he was the Amir of Sialkot Jamaat. He was a Cricketer and a Sportsman. Hazrat Mir Sahib was a handsome person and was always well dressed. He had full command over English language and was a great Orator and Debater. His knowledge of Bible and the Holy Quran was vast. On my arrival he warmly welcomed me and offered to assist me in my missionary work. I was greatly impressed by his vast knowledge, piety and righteousness. Hazrat Mir Sahib was a regular speaker on Islam at Hyde Park Corner, on Sundays. He invited me to attend his oratory sessions and help him in carrying his make shift rostrum. This was a most informative and educative experience for me and I enjoyed these sessions. After his speech there used to be a lively Question Answer session. Hazrat Mir Sahib encouraged me to take part in it and to answer some questions. I was not fluent in English then and was reluctant to answer questions but Hazrat Mir Sahib insisted that I should take part in it. Slowly I gained confidence and was able to take part in the discussion. After his oratory sessions we would go to a café in Marble Arch and would also invite some Non Muslims for further discussions on various Islamic aspects. Hazrat Mir Sahib believed in the freedom of speech and expression and would patiently listen to those who raised objections against Islam. He never lost his temper and was most considerate. When I reached London in the early part of 1959, Dr. Abdus Salaam lived in Putney, about a mile and a half from the Fazl Mosque. He was already a Professor of Theoretical Physics at the Imperial College. I had repeated opportunities to meet him. He visited the Mosque very often. Although he occupied a very high position and I was a mere young Missionary he always showed great kindness to me. He would often invite Hadhrat Chaudhry Zafrulla Khan Sahib and some other friends for breakfast at his house. It was always an informal affair and I too would be invited on such occasions. Along with other eulogists, I would also benefit from his discourse. Poetry, Literature and current events would normally form subjects of discussion on such occasions. Doctor Sahib would be a guiding light in such assemblies. Later on, when Hadhrat Chaudhry Muhammad Zafrulla Khan took up residence in London and would be invited by Dr. Salaam I would also receive an invitation. Dr. Salaam, apart from his scientific achievements, also showed a great deal of interest in Urdu and Persian poetry. He was a great admirer of ‘Hafiz’, the famous Persian poet. He had memorized very many of his verses, which he would recite on appropriate occasions. He dearly loved ‘Maulana Rum’ and had memorised very many of his verses. Doctor Salaam adored Hadhrat Chaudhry Muhammad Zafrulla Khan and always consulted him, even about his personal and private matters. He would act in accordance with the advice tendered. Shortly after my arrival in London his father, Hadhrat Chaudhry Muhammad Hussain, also visited London. Naturally, Doctor Sahib was devoted to his esteemed parent and held them in very high regard. The various outstanding politicians and scientists who came to meet him were always introduced to his father. When it was arranged for Doctor Sahib to meet His Royal Highness, the Duke of Edinburgh he took his father along with him and introduced him to His Royal Highness. Once he came to the Mission House and said to me that his father, sitting alone in the house got bored. He wondered if it would be in order for him to drop his father at the Mission House in the morning and collect him again in the evening on his way back from the college. He thought that in this way his father would remain involved and would have an opportunity to meet other Ahmadi friends. I said: “It would give me great pleasure to have your father at the Mission House. In this way the Jamaat will benefit from him in the field of Tarbiyyat.” Therefore, Chaudhry Muhammad Hussain Sahib started visiting the Mission House every single day. He would spend a lot of time with me in my office discussing various educational and Tarbiyyati matters. Dr. Salaam was one of the first to reach the Mosque for Friday service and he normally sat in the front row immediately behind the Imam. When I delivered my sermon, Dr. Salaam would make certain notes in his notebook. One day, as a joke I said to him: “Perhaps you like my sermons so much that every now and then you take notes.” The doctor laughed aloud and said: “The truth is that every now and then in my mind I receive an electrical impulse which is often brilliant and concerns some scientific issues. I make an immediate note so that in the future they would form the basis of my research. 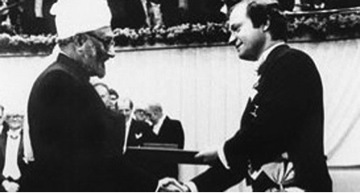 Dr. Salam receiving Nobel Prize from King of Sweden. Unless I make a note of them immediately there is a danger of them being lost.” This was his custom day and night. Even when he was eating, he would suddenly open his notebook and write something in it. He would then resume the conversation in which he was engaged. Dr. Salaam was wholly and utterly devoted to Pakistan and loved his country. When I obtained my British passport, I suggested to him at the breakfast table that he should also apply for British nationality and get a British passport, as on a British passport he would find travelling in foreign countries a lot easier. I offered to bring the application form for a British passport across for him. He remained quiet for a while and then said: “I will never abandon my Pakistan nationality. I am hopeful that before long I will be awarded the Nobel Prize and on my account I would hate to see a country other than Pakistan to be recipient of that honour. I am a Pakistani and I will always remain a Pakistani even though I may have problems in my travels.” Therefore, throughout his life, he remained a Pakistani and he died a Pakistani. He was utterly devoted to his parents. When his father passed away, he was grief stricken and confined himself to his house. A few days later I heard from his wife that he had taken the event to heart and could not devote his mind to any other subject. She said: “Kindly ask Chaudhry Sahib to visit and console him.” When I mentioned this to Chaudhry Sahib, he visited Dr. Salaam who was badly grief stricken. Hadhrat Chaudhry Sahib made an effort to console him and said: “Grief beyond a certain degree is liable to become shirk.” Quoting himself as an example he said that although he was an arch lover of his own mother, on her demise he patiently became reconciled and accepted the Will of Allah. After talking to him for a while, he embraced Dr. Salaam and held him in his arms for a long time. Dr. Salaam broke down and wept bitterly. That was how he lightened the burden of his grief. Both his parents were ‘Olia of Allah’ and were recipient of true dreams and visions. They were prayerful. They dearly loved God’s creation and came to the assistance of the poor. Mrs Salaam served as Sadar (President) of Lajna Imaullah UK for very many years. Throughout the period when I was Imam and Missionary in charge in the UK, I received complete co-operation from her. She always remained engaged in service to the community. She also remained engaged in taking care of and showing hospitality towards the guest of her husband. In early sixties Capt. Muhammad Hussain Cheema was an enthusiastic member of the Southall Jamaat. Prior to his arrival in the UK he was a personal bodyguard of Hadhrat Khalifatul Masihh II in Rabwah. He was a retired Army officer and had devoted himself, after retirement, to serve the second and the third Caliph of Ahmadiyya Muslim Jama’at. Captain Sahib had a commanding personality and was always well dressed. 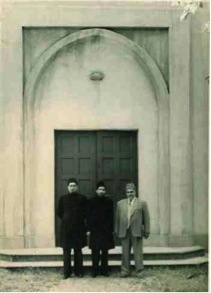 He accompanied Hadhrat Khalifatul Masih II during his trip to Europe in 1955. 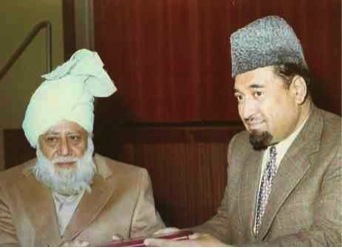 After his departure from his service as Afsar Hifazat (Security Chief) of Hadhrat Khalifatul Masih II, he arrived in Britain in the late fifties and got a job in Southall, Middlesex, England. On my arrival in 1959, I was appointed Deputy Imam at the London Mosque and Finance Secretary of UK Jama’at. In those days we did not have any transport of our own. To meet Ahmadi friends and to collect Chanda (contributions) I used to travel by public transport. There was no direct public transport from our mosque in Putney to Southall. Sometimes it would take me the entire day to travel and meet members of the Jama’at. On my second or third visit Captain Sahib suggested that if he was given a Receipt book he would be happy to collect contributions from Ahmadis living in Southall. I was greatly relieved and gave him the receipt books and appointed him the first finance secretary of Southall Ahmadiyya Jama’at. In 1962, a large number of Pakistani Ahmadis arrived in Britain to beat the forthcoming Voucher system introduced by the British Government to curb the influx of immigrants from the Indian sub-continent. Their first port of call was the London Mosque. We made arrangements for their boarding and lodging in the Mission House and in some Ahmadi houses. Our first priority was to find them jobs. Captain Sahib came to our rescue and offered his services to find jobs for many of them in Southall. Numerous job seekers were sent to him and all of them were soon employed in various factories. In his later life he started memorizing the Holy Quran and was able to memorize a large portion of it. He attended the Tarjuman-ul- Quran classes of Hazrat Khalifatul Masih IV regularly. I had seen tears in his eyes quite often while reciting the Holy Quran. He used to do Ea’tikaf (retreat in the mosque during the last ten days of Ramadhan) and would recite the entire Holy Quran during the Ea’tikaf. Captain Sahib was a pious, obedient and a righteous person. He had performed several Umras and Hajj and also used to visit Qadian every year. He had a vast circle of friends and found happiness in inviting them to his home for dinners. I was one of those who had enjoyed his hospitality on numerous occasions. He had a great desire to be buried in Bihishti Maqbara (Heavenly Graveyard) at Qadian, India. As he was a Pakistani National it was not possible. He started lengthy correspondence with the Indian High Commission in the UK and requested them to give special permission for his body to be interned in Qadian. His request was denied which made Captain Sahib very depressed and sad. I tried to console him and said that Allah would grant him a place in paradise irrespective of the graveyard he was buried in. In 1991, Hadhrat Khalifatul Masih IV visited Qadian for the first time after the partition of the sub-continent. It was a historic occasion. I had the honour and privilege of being a member of Hudhoor’s entourage. On our arrival there I met Captain Sahib in the Mubarak Mosque. He was very happy to meet me and invited me to have tea with him the next day at his residence. He said he had bought some special bananas and tangerines and would also get some fresh fish to be fried at Daru-Ziafat (public kitchen). I gladly accepted his invitation and promised to be with him after Asar prayers the next day. But Allah had His own plans for Captain Sahib. He died early the next day and as he had wished all his life, was buried in the Heavenly graveyard, Qadian. Huzur led his funeral prayer service. Allah saved him from begging the Indian Government to give permission for his remains to be buried at Qadian. Almighty Allah brought him to Qadian alive and then made him to die there to be buried there as he had wished. God is Great. given a Receipt book he would be happy to collect contributions from Ahmadis living in Southall. I was greatly relieved and gave him the receipt books and appointed him the first finance secretary of Southall Ahmadiyya Jama’at. In 1963, a large number of Pakistani Ahmadis arrived in Britain to beat the forthcoming Voucher system introduced by the British Government to curb the influx of immigrants from the Indian sub-continent. Their first port of call was the London Mosque. We made arrangements for their boarding and lodging in the Mission House and in some Ahmadi houses. Our first priority was to find them jobs. Captain Sahib came to our rescue and offered his services to find jobs for many of them in Southall. Numerous job seekers were sent to him and all of them were soon employed in various factories. In 1991, Hadhrat Khalifatul Masih IV visited Qadian for the first time after the partition of the sub-continent. It was a historic occasion. I had the honour and privilege of being a member of Hudhoor’s entourage. On our arrival there I met Captain Sahib in the Mubarak Mosque. He was very happy to meet me and invited me to have tea with him the next day at his residence. He said he had bought some special bananas and tangerines and would also get some fresh fish to be fried at Daru-Ziafat (public kitchen). I gladly accepted his invitation and promised to be with him after Asar prayers the next day. But Allah had His own plans for Captain Sahib. He died early the next day and as he had wished all his life, was buried in the Heavenly graveyard, Qadian. Huzoor led his funeral prayer service. Allah saved him from begging the Indian Government to give permission for his remains to be buried at Qadian. Almighty Allah brought him to Qadian alive and then made him to die there to be buried there as he had wished. God is Great. Maulvi Abdul Karim sahib belonged to a very pious Ahmadi family of Pakistan. His father was a companion of the Promised Messiah and was a great scholar of the Ahmadiyya Jamaat. His brother Mauvlvi Muhammad Ahmad Jalil Sahib was my teacher of Hadith in Jamia tul Mobashireen (Missionary Training College). He was also Mufti of the Jamaat and Chairman of the Qadha Board. Maulvi Abdul Karim was a missionary of the Jamaat in Sierra Leon for a number of years. On his retirement from Tehrik I Jadid he arrived in the UK and settled in London. Maulvi Sahib devoted most of his spare time for Mission duties. Fortunately he was the owner of a car which he used mostly for the service of the Ahmadi friends and the Mission. 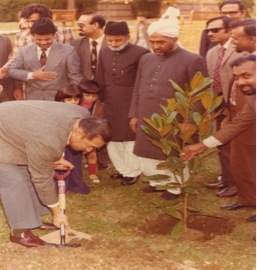 He served as a Quaid Khuddamul Ahmadiyya, London for a number of years. He was also very active in Ansarullah. He was an orator, a writer and a scholar. Maulvi Sahib had a charming personality and a cheerful disposition. Young members of the Jamaat enjoyed his company and his educative discourses. He had a wide circle of friends not only in the Jamaat but outside also. Maulvi Sahib had photography as his hobby. He made hundreds of slides of the Mission functions and also made some historic movies of Qadian and Rabwah. His slide shows were in great demand in various Jamaats of the UK. Maulvi Sahib compiled a split word translation of some chapters of the Holy Quran. He had the intention of rendering split word translation of the whole of the Holy Quran but due to ill health was unable to complete it. Maulvi Sahib was a trustworthy friend, a pious Ahmadi Muslim and a selfless worker of the Jamaat. If a list were to be compiled of those who served the Jamaat it would become very lengthy. In any case, this is not the right place for it. Aziz Deen Sahib was like my brother, indeed he was my brother. He was most affectionate and he always shared with me my moments of joy and sorrow. He was my confidante and he was my associate. His company was like being in a meeting with the righteous. Aziz Deen was loaded with enviable attributes. He was noble, tall, handsome, gifted with masculine magnificence and graceful. He was comeliness personified. Apart from all these qualities, in the matter of integrity and Taqwa(Righteousness), he had achieved a very high order. It’s a well-known saying “He who repents in his youth follows the pattern of a prophet”. Aziz Deen was one of those. He could never have been responsible for casting a wicked eye on others, iniquitous dealings or any other unsavoury pursuit. He once told me that during World War II, at the peak of his youth, he had a furniture shop. A young woman once visited the shop, bought some furniture and gave her address to which the furniture was to be delivered. She said that she would pay at the time of delivery. The next day, he said, he went to the given address to deliver the furniture. A young good-looking girl emerged from the house and said that her mother had gone out of the house but that she had left with her the price of the furniture. She asked him to arrange the furniture in the basement, which he did. He sat in a chair waiting to be paid when the young girl appeared with nothing on. As soon as he saw her in this state, in a huff, he rushed upstairs and left without receiving any payment. He breathed a sigh of relief when he got to the road. He thanked God that by His sheer Grace He had saved him from a horrific trial. He begged His forgiveness throughout that day. All this occurred when he was at the zenith of his youth. This occurrence took place in the days when, on arrival in the West, Indian young men got deeply involved in merrymaking and even risked their future. Aziz Deen was extremely fond of conveying the message of Islam; in fact, he was fanatical about it. The singular object of his life seemed to be Dawat ill Allah (Inviting people to Allah). Once he took me to the Old Bailey where he worked as an interpreter. On that day a Judge, well known for his short temper, was presiding. During the interval, as the Judge was proceeding to his retiring room, suddenly, Aziz Deen rushed towards him. After greeting him, he said: “If you don’t mind may I present to you a book?” At this apparent audacity on the part of him, the Judge’s staffs were flabbergasted and this reaction was evident from their faces. However, the Judge accepted the book, ‘The Philosophy of the Teachings of Islam’. Aziz Deen had written his name and address on the inside of the book. After the Judge had entered his retiring room his staff threatened Aziz Deen and told him that in the Court premises, neither a book nor any other article could be given to a Judge and it was quite possible that the Judge would take some action against him. However, Aziz Deen took no notice of the intimidation. A few days later he happily came to the Mission House and showed me a letter that he had received from the Judge in which he had thanked him for the present. Not only had he highly praised the contents of the book but he also invited him to his country home for tea. Habitually Aziz Sahib kept a few small booklets and pamphlets in his pockets and whenever an opportunity arose, he would present some. Once the subject of Life Insurance was under discussion. Aziz Sahib told me that he had never had the slightest desire to insure his life as he was fully confident that Allah would never allow his children to go to waste and that beyond the imagination of any Insurance Company He would bless them abundantly. He was deeply in love with the Mosque and that attribute was characteristic to him. His obedience and love for the Imam of a Mosque was also an outstanding quality. He would often say: “It’s my experience that those who do not regularly bring their children to the Mosque and do not admonish them to strengthen their ties with the Mosque, either gradually sever their connection with it altogether or sometimes their contact with the Mosque becomes very fragile. Once we made an assessment and discovered with surprise that the children of nearly 70 % of those parents, who were not regular in their visits to the Mosque, gradually distanced themselves from it. In the summer or in the winter, whether the weather was pleasant, overcast or snowbound, Aziz Deen never allowed his contact with the Mosque to be weakened. He maintained a positive and a loving relationship with the Imams of the Mosque. He often said that he who obeyed the Missionary became recipient of unbounded blessings. A particular attribute of his was the extreme love and devotion towards the members of the family of the Promised Messiah. His respect and devotion towards each member of the family was his specific quality. He regarded hospitality and being of service to them a matter of pride. In 1961 when the beloved daughter of the Promised Messiah, Hadhrat Nawab Amat ul Hafeez Begum Sahiba came to England, he pleaded with me to request her to stay with him. A daughter of Begum Sahiba was also with her and both stayed with Aziz Deen for nearly three months. With great pride, he would mention that when a daughter of the Promise Messiah (pbuh) visited London she blessed his house. Aziz Deen had the rare privilege of serving Quaid e Azam Muhammad Ali Jinnah at the Mosque on several occasions. At all functions, he discharged responsibilities normally assigned to a host. Disgusted with the attitude of the Indian Muslims and in the absence of any practical measures the Quaid e Azam moved to London. He bought a house in Hampstead and started practice in the Privy Council. He announced that he would have no interest in or involvement in Indian politics. Hadhrat Khalifa tul Masih II who kept a watchful eye on the political developments in India directed the Imam of the London Mosque, Maulana Abd ur Raheem Dard, to persuade the Quaid e Azam, who in those days was merely referred to as ‘Mr Jinnah’, to return to India and once again assume leadership of the Muslims. Huzur said that he could not see anyone amongst the Muslims leaders who had the necessary ability to lead. Maulana Dard was directed to advise Mr. Jinnah that if he agreed to return to India he would have the full support of the Jamaat Ahmadiyya. On receipt of these instructions, Maulana Dard got in touch with Mr Jinnah and invited him to the Mosque for tea. He told him that he had a message from the Head of the Jamaat Ahmadiyya to convey to him. The Quaid accepted the invitation. On the morning of the Quaid’s visit Maulana Dard instructed Mr Deen to make the necessary arrangements for tea. Mr. Jinnah came at the appointed time. Both Maulana Dard and Mr. Jinnah sat in the drawing room of the house at 63 Melrose Road. Aziz Deen went to fetch tea and after placing it on the table he was about to leave when Maulana Dard invited him to join them. Maulana Dard conveyed the message from the Second Successor to the Promised Messiah, to him. He began his efforts to persuade him to return to India but the Quaid remained adamant and insisted that he would not return. Four or five similar sittings ensued. On each occasion Maulana Dard invited Mr. Deen to join in the discussion. 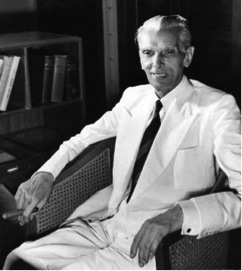 Quadi Azam M. A. Jinnah. Aziz Deen relates that once, Colonel Douglas had said to him: “I am surprised that in such a short space of time the Mirza’s Movement had made such rapid progress.” I request friends to pray that the Almighty may raise the status of my dear brother in Heaven. May He shower His blessings upon his wife, his children, and his grandchildren? Syed Iqbal Shah Sahib who had migrated from East Africa and had settled in London was a person who was indeed gifted with the traits of an angel. Every day, without fail, he would come to the mosque and very happily attend to the work of the Finance Department. In the matter of Taqwa, high morals and good dealings he was outstanding. He was humble, sympathetic and God fearing. Right up until the time of his death he served the Jamaat with great sincerity. May Allah reward him abundantly. Two of his sons, Dr. Vali Ahmad Shah Sahib and Mansoor Ahmad Shah Sahib are following in the footsteps of their father. Watching them progress in the spiritual field not only gives me great pleasure but the remembrance of their father is also revived. Bilal used to spend his weekends at the Mission House. During this time he would mow the garden of the Mission House, clean the Mission House and even would cook delicious Indian curries. Bilal remained a bachelor all his life. (Call for prayers) representing the English Ahmadi Muslim Community on the official opening of the Fazl Mosque. Hazrat Malik Ghulam Farid Sahib gave the first Adhan representing the Asian Ahmadi Muslim Community. We organized a meeting at the Mission House to commemorate the memory of Hazrat Khalifatul Masih II, on his demise. Bilal Nuttle was one of the speakers. When his name was called, he stood at the rostrum for a few minutes without uttering a word and then broke down. Tears of sorrow were flowing on his face and his voice was choked with emotions. He then left the rostrum and sat down still crying bitterly. Later he apologised and said that he was unable to control his emotions, as he loved the Second Khalifa very much. I had close friendly relationship with Bilal and we used to spend hours together. He was most cheerful, generous and righteous and always smiling. He had a sister who lived in the countryside. Bilal once went to spend a few days with her. There he had a fatal heart attack and left this world to take his place in the Heaven. “Firstly, we do not have the resources to publish a periodical. Secondly, often, in their zeal, some missionaries launch periodicals and then are unable to continue. Consequently we suffer disrepute.” I wrote to the Vakilutabsheer that if I was given the permission to start publication of the magazine I would be prepared to be fully responsible for meeting all the relevant expenses. I also pledged that I would not seek any financial assistance, either from the Centre or from the British Mission. Finally, subject to the following two conditions the Centre granted me permission. 1. I would wholly support the periodical financially and no help would be sought from the Centre or from the British Mission. 2. The address shown on the periodical would not be that of the Mission House in London and it would not be attributed to the British Mission. I happily accepted both conditions. In the early years, instead of 63 Melrose Road, the address shown was 61 Melrose Road. The first issue of the periodical appeared in January 1960 and in it were published messages from Hadhrat Chaudhry Zafrulla Khan, Sahibzada Mirza Mubarak Ahmad and Basharat Ahmad Bashir. An article entitled ‘Some Misconceptions about Islam in the West’ by Dr. Muhammad Naseem appeared in the first issue. Only five hundred copies were printed and distributed free of charge. With great effort and running around “Pakistan International Airlines” gave us an advertisement. In the beginning that constituted our total income. By the Grace of Allah, the very first issue was well received. Hadhrat Chaudhry Zafrulla Khan and Dr. Abdus Salaam encouraged me significantly. 1. ‘The need for effective balance between Religion, Philosophy and Science’, By Field Marshall Muhammad Ayub Khan, President of Pakistan. 2. ‘The powers and duties of the Islamic State’, By Hadhrat Khalifa tul Masih II. 3. ‘Technology and Pakistan’s attack on Poverty’ By Professor Abd us Salaam. 4. ‘Islam or Communism’ By Hadhrat Mirza Bashir Ahmad M.A. 5.‘The Holy Month of Ramadan By Maulana A. R. Dard M.A. This issue was sold out very rapidly and in view of the huge demand; we had to print extra copies. Some amongst the non-Ahmadis were also pleased with its contents. I was its Founder, its Editor and its Financier. In order to obtain advertisements from owners of Pakistani restaurants I had to wait until the restaurants were closed, sometimes as late as 2 a.m. In this task Moulvi Abd ur Rahman helped me a great deal. Being the owner of a canteen, he would accompany me and assist me in obtaining advertisements from other catering establishments. May Allah reward him abundantly. Amen. By the Grace of Allah, the Periodical became financially self-sufficient. Articles of a very high order began to be published. Because of its popularity, the number of subscribers increased. It began to be distributed all over the world. In this manner, a seed that was planted assumed the shape of a healthy tree. In August 1962 Mr. A.R. Chaudhry, who had migrated from East Africa, became a Joint Editor with me. With his assistance, the standard of the articles published in the periodical was further improved. During this period, some special issues were brought out such as: ‘European Missions’, ‘Christianity’, and ‘Hadhrat Abdul Lateef Shaheed’. In the April 1961 issue, an article entitled 'What the War in Algeria is Costing France’ Written by Mr. R. Qureshi of Karachi, a non-Ahmadi journalist of repute, was published. This article gained huge popularity amongst the supporters of the Movement for Algerian Freedom from France. I was asked to print an additional 500 copies of that issue for which immediate payment was made. The readers also said that they would persuade some of the Algerian community in England to subscribe to the ‘Muslim Herald’. This opened a door for Tableegh amongst the Algerian community. “I am a Missionary of the Ahmadiyya Jamaat and I only publish the periodical for the propagation of Ahmadiyyat and Islam. As a Jamaat, on principle, we also oppose Communism vehemently. Already some articles on this subject have appeared in the periodical. However, I cannot possibly be a servant of the American Government, nor can I continue to edit this periodical in subordination to the American Embassy.” There the meeting ended. During the torturous days in 1974, this periodical played a crucial role. Attacks from the opponents were strongly rebutted. News of the persecution faced by the Jamaat in Pakistan with relevant photographs was published. Later on, largely based on the material that had appeared in this periodical, a whole book called ‘From the World Press’ was published. This book proved to be of great help in supporting the cases of asylum seekers in Germany. A little later Syed Mansoor Ahmad Shah also became an editor. His articles gained great popularity. With his help and co-operation, the periodical made further strides. May Allah reward him abundantly. The periodical continued to be published until 1984. For the first four or five years, I was responsible for meeting all the necessary expenses. Then the British Mission assumed the financial responsibility and freed me from this burden. In 1975, the University Microfilms Ltd. of England saved all the earlier issues on a microfilm. Another friend, Abdur Rahman Sahib, widely known as A.R. Chaudhry also migrated from East Africa. He was Headmaster of a school in Uganda, and was an outstanding teacher. On arrival in England, he bought a house near the Mission House. He took up employment in a school as a teacher but he spent many hours of the day and night serving the Jamaat. He became General Secretary of the Jamaat and until his last day, he remained devoted to the work of the Jamaat. He remained deeply involved in the Jamaat work day and night. His heart and soul were in his desire to serve the Jamaat. To me he was as dear as my own real brother was. His wife, Tahira Chaudhry Sahiba, taught for many years in English schools but at the same time, she gained distinction in the performance of work for the Jamaat, especially for the Lajna Imaullah. May Allah accept and acknowledge the services of these two. In 1962, Hadhrat Mirza Bashir Ahmad Sahib wrote to me and suggested that for the purpose of education, training and promoting mutual friendship amongst the members of the Jamaat it would be advisable to start a Paper on behalf of the British Mission. He said that it did not really matter if the paper consisted only of a few pages. In accordance with his wishes, I started publishing a bi-monthly paper, ‘Akhbaar e Ahmadiyya’. A part of it was in English. For the Urdu portion, I made an attempt at calligraphy myself. The paper was printed on a cyclostyling machine and was distributed free of charge. Apart from the Jamaat news, it contained rebuttals of the allegations from our opponents. Articles concerning education and training formed an important part of it. In the beginning, the cyclostyling machine was operated manually and it was quite a chore. A few years later, an electric machine was purchased. By then the standard of calligraphy and printing had improved considerably. For calligraphy Malik Khaleel Ahmad, Lateef Jan and for printing Muhammad Ilyas Nasir Dehlvi rendered invaluable service. By the Grace of Allah, this paper kept on progressing day by day. Even now, this paper is regularly published every month. Another person, Muhammad Akram Khan Ghauri Sahib also migrated from East Africa. He settled in a house that he bought near the mosque and remained engaged in service to the Jamaat. He would visit the Mission House every morning and served very happily. May Allah grant him an elevated station in Heaven. His younger brother Mr. Nazim Khan Ghauri was an enthusiastic member of the Jamaat. He was a keen sportsman and had organized various sports events of the Jamaat. He played for Kenya Hocky eleven while he was there. Although we were of the same age his obedience to me, as Imam was admirable. May Allah grant him a place in His choicest Paradise. Some sincere friends who were intimately related to me for Jamaat work are still in the land of the living but I am not mentioning their names here. May Allah grant them long lives and shower them with His blessings. Abdur Raheem Sahib of Mauritius had a very quiet temperament but he was exceedingly courteous. He was hospitable and took great pleasure in serving others. He took a great interest in the work of the Mission. He was a bachelor for a long time and over the years had become an expert cook and on the occasion of Eid and other functions, he would cook for all the guests at the Mission House. He eventually married rather late in life. Both Bashir Ahmad Bajwa and Daud Ahmad Gulzar were devoted friends and servants of the jamaat; may Allah exalt their stations in Heaven. I had another two friends whom I can never forget. They were Ch: Hidayat Ullah Bangvi and Mr Nazir Ahmad Dar. Both these gentlemen having retired from very senior positions remained wholeheartedly engaged in the service of the Jamaat. For a long while Ch: Hidayat Ullah Bangvi served as First Secretary in the Pakistan Embassy in London. Mr Nazir Ahmad Dar served as an Inspector General of Police, in Tanzania and for having rendered outstanding service had been honoured by awards from the British Government. When Hidayat Ullah Bangvi was first posted as Second Secretary in the Pakistan Embassy he came to my office to see me. I was then the Imam of the London Mosque. During this very first meeting, I was deeply impressed by his devotion, sincerity, humility and deep love for the Jamaat. At the very first meeting he made an offer to serve the Jamaat in any capacity. Soon he would spend all his spare time in the Mission House. He worked in various capacities and soon, as a result of his pleasant demeanor, willingness to help others and humility he created a vast circle of friends. I was particularly impressed to find in him complete harmony between what he did and what he said. He always spoke the truth and in simple words. Although he had served in very high positions it was difficult to find another as obedient as he. We were very fond of each other and our relationship developed to a stage where we could be real brothers. There are very many incidents in my mind that I would one day, Inshallah, record. I pray that he may be given an exalted position in Paradise. He always fully discharged his responsibility towards his friends. He was always willing to serve others. He was always found to be a well wisher of all. He adhered to his principles so meticulously that very often some people were offended. However, everyone knew that his heart was filled with love for all. Until the very last day of his life, he continued to serve the Faith. I had a special relationship with him of love and sincerity. As Imam, I worked very closely with him for a long time. He was a perfect example of obedience. Occasionally he would take a stand but whenever I said anything in my position as the Imam, he would agree and never deviated even slightly from the dictates of obedience. Both these gentlemen were blessed with the opportunities of being close to the Kholafa of Ahmadiyyat. They presented an excellent example of love and devotion for the Kholafa. .
Now we do not physically see so many but we cannot possibly forget them even if we try. Immediately opposite the Buckingham Palace in Central London, full of colorful flowers and some very tall trees, is situated a very attractive and extensive Park. On one side of the Park, there is a whole string of famous Hotels and on the other; there are shops on the Oxford Street. Right in the middle of the Park there is a beautiful lake called ‘The Serpentine’, which is spread over an area of 41 acres. In the summer, it provides an ideal location for relaxation, pleasure and boating. In the winter, when it freezes, people skate on its icy surface. On either corner of the Lake, there are some smart restaurants in which people can eat and from where tourists can buy various items of food and drink of their own choice. Early in the morning, some affluent persons ride in the Park. Around the bridle path, there are whole rows of bushes and trees. Very often, when it is still dark, some members of the Royal Family also ride in the Park. Throughout the day, tourists, students and others, when exhausted after shopping or some other pursuits, gather in the Park. Under its trees, completely oblivious of all worldly affairs, one can see students engaged in their studies. One can also see whole families busy picnicking. Everyone seems to be absorbed in his own pursuit. There is never any threat of interference from others. Some, stretched on the green grass, baking in the sun, calmly snore and relax. It must be remembered that brilliant sunshine is somewhat of a rarity in England. Those relaxing in the Park are least bothered by the hustle and bustle in the 361 acres of the Hyde Park. However, the most significant and the most interesting part of the Park, situated opposite the Marble Arch and the Oxford Street is the place normally known as ‘Speaker’s Corner’. A large number gather there on Sundays. Traditionally, this corner is reserved for speakers and just about anyone can get up and speak on any subject of his choice and for as long as he likes. If a crowd gathers to listen to him, good luck for him. Some speakers continue to speak even when there is no one listening to them. To address the crowd, those who speak regularly, usually bring with them a small stool on which they stand. There is seldom a preamble to an address. The speakers just get up on their feet and begin to speak. Good speakers can attract a sizable audience. Some professional hecklers are always present who by asking various awkward questions attempt to enervate speakers and then they move on. Some great politicians have in the past been speaking in this very Park. In his early years, Nye Bevin also started his political career in this very Park. Some outstanding socialist leaders also used to speak there regularly. 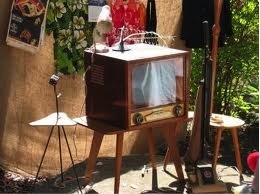 In the afternoons or early in the evenings, when there was no TV and no other means of amusement were available people used to assemble there to listen to the speeches. Milling crowds were a common sight. One never saw a Policeman. Heated discussions ensued and were a familiar occurrence. Around sunset, the audience melted away into neighboring restaurants. Clutching their wooden stools the speakers also vanished until the following Sunday. Mainly tourist spent stress-free hours in the Park. Now the whole atmosphere in the Park has undergone a change. Neither the speakers nor the audience seems to be serious any more and that was a special feature of the Park in earlier days. Now most speakers are from amongst the colored and foreigners and some tend to use foul language. Therefore, the audiences do not have much of an opportunity to listen to opinions covering serious subjects. Even the Police are now visible and sometimes even a scuffle erupts. If this trend continues, the British Government may have to put an end to this ancient tradition. Every Sunday, for the last half a century, some unwavering serious minded speakers have been speaking there. They were the ones who attracted crowds. Amongst them were Christians, Socialists, Atheists and Unitarians. One person, to my knowledge, had been seen in the Hyde Park Corner for a continuous period of 22 years. This person hardly ever spoke. He carried a placard on which was written “Repent for the End is nigh”, i.e. the Doomsday is near. He never made any speeches but with his placard in hand just moved around. However, if any questions were asked of him, he would open his Bible and spell out signs of the last days.He deserved great admiration for his courage. He did not represent any mission but was a mission personified. 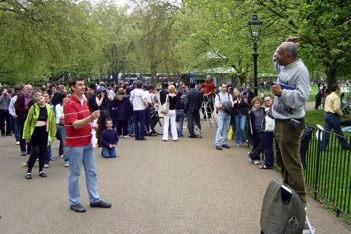 Whoever could succeed in speaking at the Hyde Park Corner was sure to become a good speaker. There, questions were showered from all sides and professional hecklers made the speakers life miserable. Sometimes they exceeded all limits. Any speaker who could handle them would never be afraid of confronting any audience. Some Christian denominations used Hyde Park Corner as a training ground. Every week, under the guidance and supervision of a tutor, some young clergy delivered speeches. Normally, on their own, these speakers remained engaged in their speeches and only, if and when necessary, the tutor butted in and guided them. If any difficult questions were asked, the teacher answered them. Normally all speeches were extempore. I have never seen anyone delivering a written speech. Since the use of loud speakers was not permitted, so that even those at a distance could hear him and benefit from the speech, a speaker had to get used to speaking very loudly. In short, the Hyde Park Corner in England was a Commanding institution where one witnessed an admirable example of free speech. The great privilege of introducing Islam into the Hyde Park Speaker’s Corner belongs to the Ahmadi missionaries. They were the first to propagate Islam there. There we got a number of converts to Islam. Bilal Nuttall was one of those. He had the rare privilege of calling Adhan on the inauguration of the London Mosque. How, from this Christian platform, the Islamic call was raised is an interesting story. 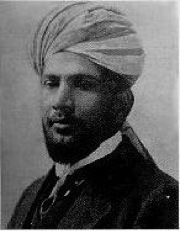 Hadhrat Chaudhry Fateh Muhammad Sial was our first missionary in England. He arrived in England in 1913. He felt that work for the spiritual conquest of Islam should commence from the Hyde Park Corner. Accordingly, he started speaking there and his efforts were blessed with Success. Hazrat Chaudhri Fateh Muhammad Sial. Now hear the story in his own words. He said:“I went to Hyde Park on a Saturday where speakers from various faiths and societies were speaking. The Atheists attracted the biggest audience. An Atheist stood up to speak and he raised certain objections against the Old Testament and Moses. Then he enlarged his subject and started criticising all Religions and all those who believed in God. After that, he allowed a quarter of an hour for those in the audience who wished to refute his arguments. Amongst the audience, there were a few Christians. Most were Atheists and no one had the courage to speak up. Taking advantage of this occasion, in simple terms, I spoke on the subject of existence of God. My emphasis was on ‘Divine Revelation’. I tried to explain that any knowledge based on Divine Revelations was always trustworthy and reliable. At the end of my speech, which only lasted for quarter of an hour the Atheist speaker tried to make fun of me. He said that many prophets had appeared in England and Piggott was still living. Therefore, there was no need for a new prophet. As I had no hope of being given more time to speak so, I stood aside. Some from amongst the audience gathered around me and started asking questions about ‘Divine Revelations’." From this beginning, the process continued and for a long while the name of Islam and the name of Hadhrat Muhammad Mustafa (saw) was heard through our celebrated missionaries. When Hadhrat Yaqoob Ali Irfani toured Europe, while in London, he delivered speeches in Hyde Park on a regular basis. Influenced by his speeches our dear brother, Bilal Nuttall became a Muslim. Speakers at Hyde Park Corner. In the beginning, our Mission House was situated quite close to Hyde Park. Therefore, our missionaries were able to invite to the Mission House those amongst the British audience who showed some interest in Islam. There, apart from conveying the message of Islam, they were also given some literature. Hadhrat Qazi Muhammad Abdullah, Hadhrat Mufti Muhammad Sadiq, Hadhrat Moulvi Abd ur Raheem Nayyer, Hadhrat Moulvi Sher Ali, Hadhrat Meer Abd us Salaam, Hadhrat Aziz Deen, the father of Abdul Aziz Deen and Hadhrat Maulana Shams top the list of those who spoke in Hyde Park Corner. It must be mentioned here that Mr Abdul Aziz Deen who has been referred to above was a very energetic, dynamic and sincere person. He came to England in 1928 and had stayed here ever since. His father, Hadhrat Babu Aziz Deen Sialkoti was a Companion of the Promised Messiah. During most debates he served as a timekeeper. Mr Green was a Christian missionary and held debate with Hazrat Maulana Shams Sahib in the Hyde Park. I was most anxious to meet him. Mr. Green was then about ninety years old. Whilst he was in England Hadhrat Moulvi Sher Ali also regularly spoke in the Park. A sizable crowd normally waited for him. It is strange that, possibly due to his apparent demeanor and commanding personality, no one amongst the hecklers dare bother him. Hadhrat Meer Abd us Salaam Sialkoti was also one of the regular speakers in Hyde Park. He had a complete command of the English language and was fully conversant with references from the Bible that he had memorized. 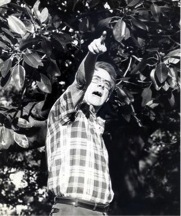 Since he stood on a tall platform and was himself tall, he could be seen from a distance while he spoke. For more than half a century Hyde Park Corner has been linked with the history of Ahmadiyyat. At Hyde Park Corner, amongst the regular speakers was a Mr. John Webster, who had, for 30 years been speaking on various subjects. In 1960, it was he who attracted the largest crowds. A while ago, a book entitled ‘Speakers of the Hyde Park’ was published and in it, a prominent mention of Mr Webster was made. His story covered many pages of the book. Soon after my arrival in England, I started going to Hyde Park regularly. I often asked questions of Christian and Atheist speakers and I got familiar with some of the speakers to whom I presented some literature on Islam and Ahmadiyyat. Once, at the end of a session, I approached Mr. Webster and he invited me for a cup of tea in a neighboring restaurant. He showed interest in Ahmadiyyat. On hearing this from him, I was thrilled to bits. On the following Saturday he came to the Fazl Mosque and signed the Form for joining the Jamaat. At the same time, he said to me that, as he was an old and renowned speaker at Hyde Park, his having embraced Ahmadiyyat should remain a secret for sometime. However, the following Saturday, when he stood up to speak, involuntarily, he started talking about the Promised Messiah (pbuh). He said that he was in a position to say that Hadhrat Mirza Sahib was engaged in the struggle for dominance of Islam. His life was pious and pure and he alone had been blessed with scholastic philosophy. 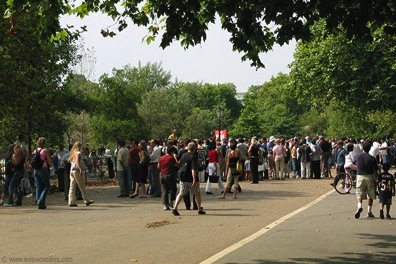 On the following Saturday a large number of Muslims from the Indo Pak Sub Continent came to the Hyde Park Corner. They tried to heckle Mr. Webster and tried their best not to let him speak. However, their efforts ended in a total failure. Mr Webster continued to speak on Ahmadiyyat. The following few weeks were somewhat troublesome. On one occasion, some Pakistani Muslims tried to physically assault Mr Webster. In a scuffle that followed two or three Ahmadi listeners received injuries. One of them was Muhammad Ilyas Nasir Dehlavi. In the hope that the conditions would once again become peaceful, the police asked Mr. Webster to suspend his speeches for a while. Mr. Webster refused and for the following few meetings the police were present in force. This situation continued for a whole year. After that Mr. Webster migrated to Australia and settled there. Mr John Webster speaking at Hyde Park. In 1959, the UK Mission House was spread over two adjacent houses on Melrose Road. At 63 Melrose Road the main office of the Mission House was located. It had three floors and in addition had a basement. The Ground floor was used for general meetings and entertaining guests. The remaining two floors were the Imam's residence. The kitchen was situated in the basement and there were two other adjoining rooms normally used for cooking. There were two rooms on the ground floor, the dividing wall was demolished and instead a sliding door was provided. The sliding door remained open for meetings. Apart from that, there were two other office rooms. There was a balcony on one side. The two upper stories served as the residence of the Imam. The house at 61 Melrose Road belonged to an English person who became a bitter opponent after the construction of the mosque. He objected to the call for prayers (Adhan) from the mosque and he even took the matter to court where it was decided in favor of the Jamaat. During the Second World War when a few bombs fell around the mosque, he put up a ‘For Sale’ notice. However, out of racial prejudice he instructed the Estate Agent not to sell the house to anyone connected with the Jamaat. Hadhrat Maulana Jalal ud Din Shams Sahib was then Imam of the London Mosque. He sent a British convert to Islam to the Estate Agent and he made an offer, which the owner accepted. Therefore, the house was registered initially in the name of the British convert and then it was transferred to the Jamaat. This house had the great honor of housing Hadhrat Khalifa tul Masih II when he visited England in 1955. He lived on the ground floor. When I first came to England, apart from the flat on the top floor, the rest had been let out to various Ahmadi tenants. In 1964 when I was appointed Imam I myself shifted to 63 Melrose Road. The house at 63 Melrose Road was indeed historic. 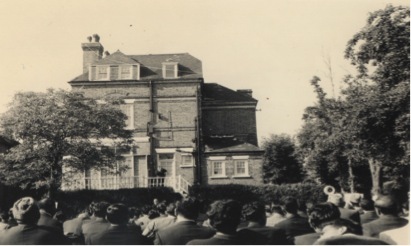 During his tour of England in 1967, Hadhrat Khalifa tul Masih III stayed in it. Both these houses, i.e. 61 and 63 Melrose Road were subsequently demolished to make way for the newly built Mahmood Hall Complex. In 1960 the Pakistan International Airlines acquired their first Jet propelled Boeing. For their inaugural flight, they invited some Pakistani and British dignitaries from London to fly with them in the new Boeing. I also received an invitation. Perhaps in the month of April 1960, with permission from the Centre, I went to Pakistan for nearly a month. During my stay there, two or three times, I had the good fortune of an audience with Hazrat Khalifatul Masih II, who, in those days, was unwell. In the course of a meeting Huzur directed that we should pay particular attention to Tableegh in Brighton. He said that in 1924 when he toured England he visited Brighton at the invitation of the Brighton Council. During that visit he saw the room where, as guests of Queen Elizabeth I, some Turkish Muslim Generals had stayed. On the walls of that room Kalima Tayyeba and some Quranic verses had been inscribed. He stressed the need to pay particular attention to Tableegh in Brighton. On my return to England, I made up my mind to set in motion Tableegh work in Brighton. Mr Abdul Aziz Deen and I went to Brighton and rented a room in the Royal Pavilion. Announcements were made in the local papers that from the following week, every week, speeches on Islam would be delivered in that Hall. A local paper interviewed me and published a detailed account and my photograph. We printed 5,000 copies of a handbill that were distributed in the residential areas. During the first meeting, the Hall was filled to capacity. The meeting was presided over by Mr. Abd ul Aziz Deen. Moulvi Abdul Kareem and Moulvi Abd ur Rahman also attended the meeting. I spoke on the subject of ‘The Truth of Islam’. After my speech, a Christian cleric invited me to a debate, an invitation that I could hardly turn down. It was agreed to hold a debate on the subject of ‘Death of Jesus on the Cross’ on the following Saturday. The local papers published the news of the approaching debate. To attend the meeting many Ahmadi friends from London came to Brighton. A large number of British non-Muslims were also present. In fact they formed the overwhelming majority. There was considerable enthusiasm apparent amongst the audience. We all waited for the cleric but he did not turn up. It appeared that he had no intention of coming. Disappointed, I got up to speak on the subject of ‘Islam’. As the cleric had shied away from the debate, from our point of view, the local British audience seemed to have gained a positive impression. At the end of the next meeting an English lady, Miss Irene Crene joined the fold of Ahmadiyyat. Several of her articles were published in the ‘Muslim Herald’. In the course of three or four meetings, six or seven other English women and men also joined Ahmadiyyat. This way a regular Jamaat was established in Brighton. This outcome was a direct result of the attention and prayers by Hadhrat Khalifa tul Masih II. For two years, this routine was followed every week. When I was appointed as Imam of The London Mosque, because I was alone and there was no other Missionary who could be sent to Brighton, most reluctantly, we had to close this Sub Mission. Majlis Khuddam ul Ahmadiyya existed even in 1959. Malik Khaleel ur Rahman was then the Quaid Khuddam ul Ahmadiyya London. He was indeed an active and sincere member. Malik Sahib was generally known as K.R. Mullik. He arrived in this country in 1958. On my arrival in 1959 he was Quaid Khuddamul Ahmadiyya London. With dedicated team of workers he worked hard to establish Khuddamul Ahmadiyya on firm grounds. Malik Sahib was a pious and dedicated person. He was very active in the preaching of the Faith. His circle of friends was vast. On the arrival of Hazrat Khalifatul Masih IV, Malik Sahib became his interpreter. He would render his Friday sermons and Question Answer session into English. He never missed Friday service at the Mosque. In 1962 the Centre appointed me as Deputy Sadar (President) of all the Majalis Khuddam ul Ahmadiyya branches in Britain. In those days, the Sadar (President) of the worldwide Majlis Khuddam ul Ahmadiyya was based at Rabwah. Quaids were elected, but the name of every Quaid needed approval from Rabwah. In 1964 upon instruction from the centre (Markaz), this arrangement was changed and the Missionary in Charge of every country was appointed Deputy Sadar Khuddam ul Ahmadiyya ex officio. Despite being the Deputy Imam in 1962 I was chosen to be the Deputy Sadar (President) of Khuddamul Ahmadiyya U.K.
(Presidency) Lajna made considerable progress; new Lajnaat were established up and down the country and annual conventions began to be held. Her close co-operation with me as Imam and Missionary in Charge was inspiring. May Allah reward her abundantly. In those days the arrangements for heating the Fazl Mosque was substandard. During the winter there were very few who offered congregational Nimaaz (Salat) in the mosque and as heating was prohibitively expensive, from November to Easter the mosque normally remained locked. Prayers, including the Friday Service (Juma), were held in the Mission House. In those days it used to be bitterly cold in England and in December, January and February and sometimes right up until May, there was snow on the ground. The most bothersome problem during the winter was fog and smog. Often if lasted for three or four days and visibility was reduced to only a few feet. Fog and smog were dangerous for those who suffered from Asthma. approaching I cried out for help. Someone held my hand and told me that he was going in the same direction. He said he had some idea of the route and still holding my hand, he took me to my house. I thanked the Englishman most profusely. In 1965, all coal burning industrial establishments were taken out of London and thankfully, that resulted in freedom from the frequent fog or smog. The exterior of all buildings in London were black due to coal and soot. Later on, the Houses of Parliament, St. Paul’s Cathedral and other historic buildings were sandblasted and cleaned at the expense of millions of pounds. Piccadilly Circus engulfed in thick fog. In those days, on the occasion of the two Eids all those present were served lunch on behalf of the mosque. As the Mission was unable to bear the expense of feeding all those present, members of the Jamaat were asked to make special contributions. Throughout the night, in the basement of the Mission House, many members remained engaged in cooking. Until I was appointed Imam, I too used to remain engaged in cooking alongside other members of the jamaat. In those days, a large number of non-Ahmadis came to the mosque for the two Eids. Some Turk and Cypriot and Muslims from India and Pakistan also joined with us to celebrate Eid. The Mosque garden had numerous fruit trees. In summer months the fruit (Pears, Apples and plums) would fall from the trees in large numbers. We used to send fresh fruits to our neighbours and well-wishers as gift. The rest of the fallen fruit was buried. The garden was large and had many shrubs of roses and other flowers. An old retired Army officer who lived nearby requested me to give him an access to the garden. He was an amateur gardener but had no garden of his own. He offered his services to look after the garden. His name was Mr. Simmonds. I happily accepted his offer. For years he tended our large garden and enjoyed his hobby of gardening with pleasure. Every morning he would pluck flowers and make a bouquet and leave it at our doorsteps. Imam Rafiq planting a tree at the Mission Garden. An English convert Mr. Bond used to come from Brighton where he lived and would spend a few days in the Mission House basement. He was also an expert gardener. Both he and Mr. Simmonds would mow the garden and trim the trees. Mr. Bond was converted to Islam in Khan Sahib Maulvi Farzand Ali Khan Sahib’s time. Our relationship with our neighbours was most cordial. We would send curries, pulao and sweets to them on the occasions of two Eids. We received full co-operation from them. 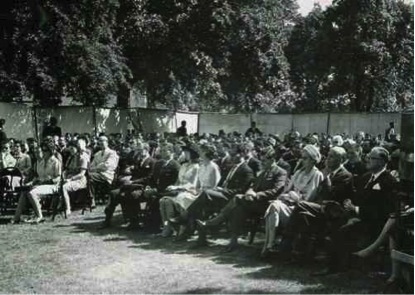 First Jalsa Salana 1964, in the Mosque Garden. In 1961, the British Government announced that soon a new Immigration Voucher system would be introduced. Until the introduction of this law people from the sub continent were allowed to come to Britain without a Visa. With this announcement there was a huge influx of Pakistanis entering Britain before the date the law would come into force. A large number of Pakistan Ahmadis also arrived and sought the help of the Mission in settling them in Britain. Those were very difficult times for the UK Ahmadiyya Mission. There was no space in the compound of the Mission House to accomodate them and give them temporary shelter and no facilities and budget to feed them. However we received them with open hands and helped them in finding suitable jobs for them. Mr. Abdul Aziz Dean and Captain retired Muhammad Hussain Cheema worked day and night to get most of the immigrants settled in Southall, Greenford, Hounslow and Hays areas. Mr. Abdul Latif Khan also worked hard to help these immigrants finding jobs for them. In 1968, the Indo/Pak settlers of Kenya were expelled from Kenyan territories. There were a large number of Ahmadies who arrived in Britain. Most of them had good businesses and brought with them their assets. The Uk Ahmadiyya Muslim Mission helped these immigrants to Britain in finding them jobs and guiding them to buy properties. They had resources to buy properties and were able to settle comfortably. In 1972 Eddie Amin of Uganda ordered all Indians to quit Uganda within 90 days. A large number of Ugandan Indian Ahmadis migrated to Britain. The Mission helped them in finding houses for sale in various areas of Britain. Most of the East African Ahmadis settled in Gillingham, Kent and London. The Gillingham Jamaat consisted mostly of East African Ahmadis. 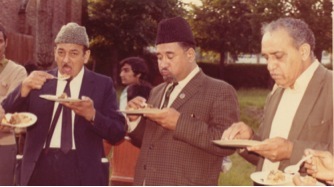 The late Qari Muhammad Yasin Sahib and the late Fazl Karim Lone Sahib served the Jamaat as Presidents of Gillingham. They were sincere, pious and enthusiastic members of the Community. Qari Sahib arrived in Britain from East Africa in the early sixties and settled in Gillingham, Kent. In those days there were hardly three or four other Ahmdi households in Gillingham. Qari Sahib soon bought a house and dedicated one of the rooms as a Mosque for the Ahmadis to offer their prayers and to have their small gatherings there. Due to his magnetic personality and his hospitality some other migrants’ from East Africa also came and settled in Gillingham. With the growth in the numbers of the Jamaat it was felt that a proper Jamaat should be formed and office bearer should be elected. Qari Sahib was elected the first President of Gillingham Jamaat. This responsibility he discharged until his passing away. Qari Sahib taught the Holy Quran to children of Gillingham Jamaat and worked tirelessly towards their spiritual and moral training and upbringing. He had a charming personality, a calm and forgiving temperament and had all the qualities of a true Momin and a Sufi. I was the recipient of his love and affection and I was very close to him. He would always tell me that he prayed for me every day. May Allah bless his soul and may he be given a lofty position in Paradise. Another good friend in Gillingham was Yusuf Ahmadi Sahib. He arrived in Gillingham in 1967 with his family. Mr Yusuf Ahmadi was most hospitable, courteous and an enthusiastic person. In Bradford there was a small Jamaat. Mr. Mansoor Karamat was the President. Mir Ziaullah Sahib who was a migrant from East Africa succeeded him. There were small but active Jamaats at Southall, Hounslow, Croydon, Huddersfield, Birmingham and Glasgow. 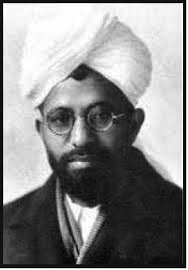 Here I would like to mention the one most sincere, devoted and Muttaqi brother Kamalud Deen Amini Sahib who was the first President of Huddersfield Jamaat. He was a lover of Khilafate ahmadiyya and was a most obedient servant of God. While talking of him I remember a faith-enhancing incidence that proves beyond any doubt that he was in communion with Allah. In 1967, Hazrat Khalifatul Masih III visited England. In this tour Huzur also visited Glasgow. While in Glasgow Kamaludean Sahib called me and requested me to persuade Huzoor to have a break journey at Huddersfield for a short time. I told him that it was not possible as a detour to Huddersfield would delay Huzur;s arrival at London where a large number of Jamaat would be present to welcome him. However I promised him that I would convey his invitation to Huzoor. Huzur stayed with the Jamaat members for about an hour and then we resumed our journey towards London. Allaho Akber. There were other sincere and enthusiastic members of the Jamaat who worked hard for the progress of the Jamaat. Among them were Khwaja Bashir Ahmad Sahib and Khwaja Nazir Ahmad sahib. Khwaja Bashir Ahmad was the Headmaster of the London Mosque Sunday School. He had a team of colleagues among who were Daud Ahmad Gulzar Sahib, Malik Abdul Aziz sahib, Maulvi Abdur Rehman Sahib and Mr. A. R. Chaudhri. Khwaja Nazir Sahib was our Press Secretary. He did a tremendous job in introducing the Jamaat in the British and Indo- Pakistani press. He was assisted by one of our hard working and enthusiastic brother Dr. Aqeel Athar Sahib. Dr. Athar Sahib also wrote articles for “The Muslim Herald”. He and Mr Khalid Sheikh helped in cyclostyling our monthly Gazette called, Akhbare Ahmadiyya. 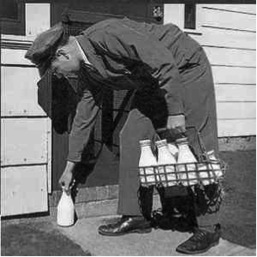 Early in the morning there were Milkmen delivering fresh milk from door to door. Usually they would carry the milk load in a battery-operated vehicle. They also carried orange juices, butter, fresh bread, clotted creams and some vegetables for sale. They used to come very early in the morning to deliver milk and other stuff. They started their deliveries from 3am. They would deliver the milk to your doorsteps and would also collects empty bottles. We used to meet the milkman very seldom as he would deliver the milk bottles and other stuff early in the morning. If we wanted more milk bottles or other stuff we would leave our order under a milk bottle. He would change our order and would leave the required stuff at the doorsteps. Every Friday he will leave his bill under one of the bottles. We would place our cheque outside under a milk bottle. This would go on for months. Home deliveries of stuff bought from the shops were a normal thing and it was free of charge. After a week of our arrival in London a friend took me to the nearest grocery shop and introduced me to the shopkeeper. He gave me a printed list of grocery items and told me to order by telephone whenever I wanted to buy some grocery. He said he would deliver the stuff in the evening and would also collect his bill. This went on for a long time. Unfortunately this system of free delivery has completely vanished. Newspapers delivery in the morning. 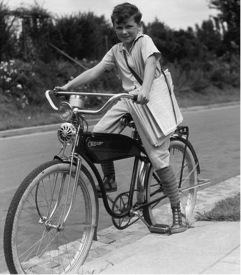 Another landmark, which is now on the decline due to free access to Internet, was Paperboys who used to deliver newspapers or magazine very early in the morning to subscribers. He used to deliver newspapers in all kind weather. Usually they used to be school children that used to get a small amount from the News shops for the paper delivery. On Christmas they would also get tips from the subscribers. I had heard of the invention of Television but had never seen one. After a few days in London one of my friends who was my classmate at Qadian came to see me. His name was Karim Bihari. He told me that he had an electronic shop where he sold Television sets. I asked him how much would a TV set cost. He told me that if I was interested he could sell me a set for 40 pounds. I told him that I could not afford to buy such an expensive item with my minimum allowance that I get from the Jamaat. He generously offered that if I paid him 25 Pounds he would install the set at my flat. The rest of the money, he said, could be paid through an installment of one pound per month. I happily accepted his offer and the next day he installed the TV set at my flat. As there was no outside Antenna he supplied an internal antenna to receive the signal. It showed programs in black and white only. It was a huge set. When Karim switched the TV on I could not believe my eyes to see moving pictures on the screen. My wife and Munir were thrilled to have a mini cinema in their sitting room. Munir loved to watch his favorite programs, “Popeye and Rawhide.” On Sundays there was an Asian program called, Apna hi ghar samajhiye. No bathrooms in many houses. In the early 1950s many homes still did not have bathrooms and only had outside lavatories. The situation greatly improved in the late 1950s and 1960s. I remember that once I was invited by the Rotary club of Preston to address them on Islam. Preston is about 220 miles from London. The lecture was in the evening. I drove to Preston and arrived there in the late afternoon. I went straight to an Ahmadi friend’s house to take some rest and take a bath/shower. I requested the friend to show me the bathroom so that I can prepare a hot water tub for washing my body. He said that there was no bathroom in his house. I was surprised to hear this and asked him as to how he and his family take a bath. He replied that there were Communal baths at the end of the street where they took bath. I requested him to take me to the Communal baths. He picked up a clean towel and took me to the Bath House. There was an old English man sitting at the Reception desk. I asked him to prepare a hot water bathtub for me. He told me that the cost of a hot water tub would be two shillings. I promptly paid him the money. After a little while he asked me to follow him to the bathroom. I entered the bathroom. The bathtub was full of hot water but there were no taps visible. I came out of the bathroom and asked the attendant about the taps. He said that the taps were outside under his control. He said bathers use too much water so we have put the taps outside. I then asked him that after taking a bath how could I rinse my body with clean hot water. He said you could use your towel. I refused to take a bath in a bathtub where there were no taps. The attendant suggested that at a cost of two and a half shillings he could open a shower room for me. I paid him two and a half shillings and enjoyed a nice warm shower. Arshad Ahmadi has sent me an interesting Email regarding life in Fifties and Sixties. All crisps were plain; the only choice we had was whether to put the salt on or not. A Chinese chippy was a foreign carpenter. Coffee was Camp, and came in a bottle. "Kebab" was not even a word never mind a food. Surprisingly muesli was readily available, it was called cattle feed. Meeting with Mohammad Ayub Khan, President of Pakistan. 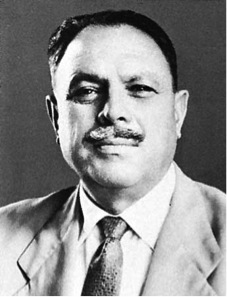 Field Marshal Mohammad Ayub Khan, the first President and Martial Law Administrator of Pakistan was on a visit to England in 1962. He stayed at Hotel Claridge's. Jamat Ahmadiyya UK welcomed him and requested for a meeting with him. The President accepted our request and gave an appointment. As per the scheduled program a delegation of the Jamat of which I was also a member, reached the hotel. There we were informed that due to some unavoidable reasons the President had cancelled all the engagements of that day. However he has accepted to meet our delegation. “Just before leaving Pakistan I received an application from your Jamat headquarters asking for a grant of foreign exchange in connection with construction of mosques abroad. I called the Finance Minister and asked him to grant the request of Jamat Ahmadiyya. The minister said that the Mullahs would launch an agitation if the request was granted and they would also apply for foreign exchange and the country was short of foreign cash reserve. “But I told the Minister that it was only the Ahmadiyya Movement who were preaching Islam abroad and this great task was not being funded by any government The contributions of the poor people is the main financial resource of the Movement. He then asked us how many people came into the fold of Islam through our preaching every year. We replied that the number of such converts was very little but we were trying to dispel the distorted image of Islam created in the minds of the British by Orientalists and Christian clergymen. We said we had achieved great success in our program. The misconceptions about Islam were gradually vanishing. A day would come when people of the West would come into the fold of Islam in large numbers. The President suggested that we should step up our missionary activities for the faster spread of Islam in Africa. He said that if we were able to create strong bastions of Islam in African countries, we could raise the voice of Islam at the International Forum very effectively and successfully. The President said that after a deep study of the African people’s mind he had come to the conclusion that African people were sincere, honest, and broad-minded and to some extent innocent also. They tend to stick tenaciously to what they think to be right and do not care for anything for the sake of truth. We acquainted the President with the activities of our Jamat in Africa. Our meeting, which was to last ten minutes, lasted for 45 minutes. We were greatly impressed with the Field Marshal’s politeness, straightforward approach and his simplicity. After a few years he again visited England. The High Commissioner for Pakistan himself rang me up and informed me of the President’s visit. He also said that the President wished that the name of the Imam of the London Mosque be included among the dignitaries who would receive him at the Airport. President Muhammad Ayub Kham of Pakistan. When the President came out of the aircraft, the people lined up to receive him. He began to shake hands with everyone. When he came up to meet me he said, “Imam sahib how many Christians have you converted to Islam this year?” Then he instructed his secretary to include my name among the invitees to every public function to be held in his honour during his tour. I was highly impressed with his sagacity and nobility of character. In the middle sixties (I do not remember the dates) I was in invited to attend Queen’s Garden Party at Buckingham Palace. It was a great honour bestowed on an Imam of The London Mosque. I arrived at Buckingham Palace Gates in time. There were no strict security checks as they are today. Simply by showing my invitation card I was admitted into the Palace Gardens. For the first time I had a glance over the beautiful gardens which were closed to the public all the year round. The weather was brilliant and the garden was in full bloom. Huge tents were erected for the Tea party. All the invitees were briefed about the protocol. We were told not to shake Her Majesty’s hand or of any other member of the Royal family unless they showed their intention of allowing the invitee for a shake hand. The Queen and The Duke of Edinburgh, accompanied by other members of the Royal Family, entered the garden at 4.00 pm, when the National Anthem was played by one of the two military bands playing selections of music during the afternoon. After passing through lines of her subjects she and the Duke entered the large tent where refreshments were served. 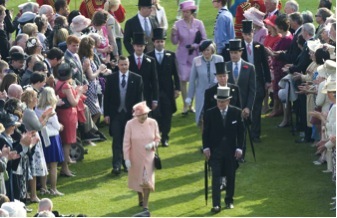 At 6pm the Queen along with her family retired. Meeting the Sultan of Brunai. Omar Ali Saifuddien III, (born Al-Marhum Kebawah Duli Yang Maha Mulia Maulana Paduka Seri Begawan Sultan Haji Sir Omar Ali Saifuddien Sa'adul Khairi Waddien III, GCVO, KCMG; 23 September 1914 – 7 September 1986) was the 28th Paramount Ruler and Sultan of Brunei who ruled from 4 June 1950 until his abdication from the throne on 4 October 1967. 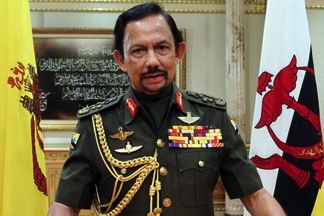 He was also the first Brunei Minister of Defense. He was known The Father of Independenceand, The Father of Brunei's Negara Zikir. (From Internet Wikipedia). The Sultan was staying at The Dorchester Hotel, Park Lane, London. Both Dr. Nasim and I arrived at the hotel at the appointed time. We were received by his Private Secretary and were taken straight to the Sultan’s lounge. The Sultan received us with open arms. I was most impressed by his humbleness, courteousness and open mindedness. After preliminary introductions, I presented to him some Ahmadiyya literature including the Holy Quran and “ The Teachings of Islam” by Hazrat Masih Mauood, Alaihisalam. The Sultan said that he had heard about the Indian Promised Messiah but his knowledge about his claims was minimal. He asked me to give him a brief introduction of the Founder of the Jamaat, which I gladly did. He promised to read our literature carefully. We stayed with the Sultan for an hour. I invited him to visit the London Mosque. Meeting the First Prime Minister of Mauritius. In 1964, the Prime Minister of Mauritius visited Britain on a State visit. I welcomed him on behalf of the Ahmadiyya Jamaat UK, and requested him to meet a delegation of the Jamaat. He said he would be pleased the meet the delegation. We arrived at his hotel at the appointed time. The Prime Minister welcomed us warmly and thanked me for welcoming him to the United Kingdom on behalf of the UK Jamaat. He said that he knew the Jamaat very well and appreciated the work of the Jamaat in promoting peace and harmony among various nationalities. He also said that he knew the Amir and Missionary In charge of the Mauritius Jamaat personally. The High Commissioner of Mauritius to Britain was also present. The Prime Minister instructed him to invite the Imam of the London Mosque to all functions of the Embassy and also to all Receptions and dinner given in his honour, in the UK. The Prime Minister invited me to visit Mauritius as a Government guest. I was very impressed by the prime Minster’s broad mindedness, humility and scholarship.